Restaurants in New York are abundant, from the very cheap to the very expensive, offering cuisines from all over the world. The choice of eateries is large, diverse and changes on an almost daily basis. There are, for that reason, always great restaurants to be found for dining in New York. However, this broad choice can also be quite overwhelming. To help make your decision a little easier, I have listed my favourite places for different occasions and categorised them below. If you want to truly impress your partner, take them to Robert NYC. It’s a modern, fancy restaurant in a fairly high price segment. The restaurant is on Columbus Circle, in the Museum of Arts and Design, on one of their highest floors. From here, you have a wonderful view of Central Park, not to mention Columbus Circle itself. Atop the indoor Italian market, Eataly, you’ll find Birreria. A brewery-annex rooftop restaurant. Here you can enjoy affordable food, combined with their home-brewed beer. You can also visit Birreria in the winter when a temporary roof and heaters are added to warm up the terrace. The best view of Manhattan’s skyline is not seen from Manhattan itself, but from the opposite side of the water. On the other side of the East River, right under the Brooklyn Bridge is The River Café. Head here for breakfast, lunch or dinner with a beautiful view of the illuminated skyscrapers over the river. Be sure to order their most famous dessert; the Chocolate Brooklyn Bridge! I think Cantina Rooftop is a real discovery! The food tastes great (and is affordable), and the view is awesome. The name gives it away a little, Cantina is a Mexican restaurant. On the menu you’ll find, amongst other things, tacos and guacamole. As well as meat and fish dishes. In addition, Cantina has a retractable roof and can be heated during the winter. GAONNURI is a Korean restaurant in Midtown Manhattan, just one block from the Empire State Building. Through the large windows, you have a lovely view of the surrounding area. 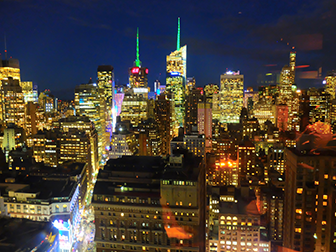 If you eat here after dark, you’ll be surrounded by the illuminated buildings of Midtown Manhattan. 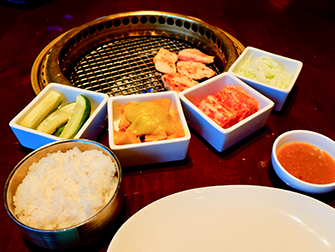 Plus, you can enjoy the surprising and varied Korean culinary experience. 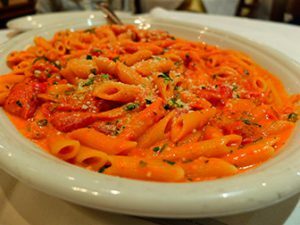 Carmine’s is a real Italian family restaurant. Boasting two locations in Manhattan, giving you double the chance of getting a table. Which is a good thing, as Carmines is always full! Are you planning on eating out with a group? Then be sure to book Carmines well in advance. When I’m planning a group dinner in New York, I like to go to John’s Pizzeria. Large tables, and large pizzas! You can easily share one between two or three people, making this restaurant very suitable for larger parties. John’s have locations on both Times Square and Bleecker Street. Olive Garden is not an ‘authentic’ New York restaurant; it’s part of a chain. However, I do recommend it for groups, it’s very suitable for large parties. The food is good, and inexpensive. In addition, its’ central location, on Times Square, makes it the perfect place to grab a bite before, for example, heading to a Broadway show. Dallas BBQ has various branches in Manhattan, as well as other New York boroughs. They are all large, open spaces where you can easily dine with a larger group. On the menu at Dallas BBQ you’ll find mainly (the name says it all) barbecue dishes. So it’s a real ‘American’ dining experience! The same goes for Virgil’s: a barbecue restaurant, well known for one dish with a somewhat unusual name,‘Trainwreck Fries’. These chips are smothered in melted cheddar and monterey jack cheese and topped with smoked ham, onions, jalapeños, with ranch dressing and I definitely recommend them! Virgil’s is a large restaurant, so you can easily head here for a group meal. If you are looking for a reasonably cheap dinner, I recommend giving Thai food a try. There are lots of Thai restaurants to be found on 9th Avenue; between 42nd and 56th Streets. Another option is to head to Chinatown for an affordable meal. Try, for example, the dumplings and dim sum at the Nom Wah Tea Parlor. It goes without saying, my favourite foods are hamburgers and pizza. Which, in general, are also inexpensive options. In addition, you can experience an authentic meal amongst the locals, for a relatively low price at one of the many diners in New York. Do you have something to celebrate in New York? An anniversary, graduation or engagement? There are many restaurants in New York, perfect for romantic occasions. But there are also some great options if you’re celebrating something else. Philip Marie is perfect for a romantic dinner for two. Especially when you book their private table in the wine cellar: Perfect for someone planning to pop that special question. However, it is also a good option for a celebratory meal for the whole family or group of friends. It’s a cosy, French-style restaurant and is often fully booked, so be sure to book well in advance. Tree Bistro is small and intimate. Their European-esque ‘secret garden’ located at the back of the restaurant is a lovely place to sit. You don’t find this kind of thing very often in New York. It’s not a large restaurant and the inside is especially tiny, so it’s mostly recommended for smaller parties. Marseille is a French-style restaurant with plenty of atmosphere, located in Hell’s Kitchen. Here, you can sit in the cosy surroundings and enjoy the French dishes. In addition, Marseille is a good option for the holidays. On Thanksgiving and at Christmas, they serve a special set menu. Head to The Park for a brunch, lunch or dinner in one of their beautifully decorated spaces. This restaurant, located close to the High Line, also has a nice garden and even a rooftop bar. Food at The Park is reasonably priced. For example, you can eat a pizza for around $15. For a truly special experience, I recommend booking a dinner cruise in New York. As you cruise past the impressive Manhattan skyline, you can enjoy a delicious meal or buffet. Dinner cruises range in price, depending on which you choose. So there is something suitable for every occasion. There are a few upscale and fancy French restaurants in New York. Any of the Jean-Georges Vongerichten restaurants are great. 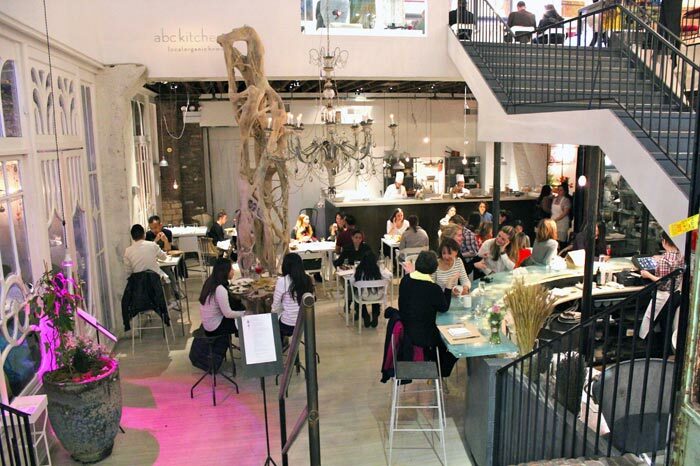 However, I personally recommend ABC Kitchen in Flatiron District. This is definitely a place to see-and-be-seen. Expect romantic lighting and to be seated amongst the best dressed New Yorkers from, for example, the fashion and modelling industries. TAO Downtown, located in Meatpacking District is a restaurant and nightclub rolled into one. It is split over various sections, however. If you are looking to dine in modern and luxurious surroundings, this is your place. The music is quite loud, but you don’t really need to talk. You’ll be too busy looking around TAO! The decor is impressive, and so are the prices. STK is short for steak but this is no regular steakhouse. These luxury restaurants are ‘the place to be’ for trendy New Yorkers that, after dinner, stick around for a cocktail and music from the resident dj. STK Downtown also has a rooftop, so is a good place for a night out. Beauty & Essex in the Lower East Side is a hidden gem in Manhattan. You enter via a pawn shop, where you have no idea of the beautiful restaurant hidden behind the store. Enter through the door at the back of the shop and you’ll find yourself in a cool and atmospheric restaurant over two floors. Are you looking for a ‘hip and happening’ restaurant but you’re more a fish than a meat-eater? Then CATCH is the place for you. One of the Meatpacking District’s trendy restaurants that later transforms into a club. For great quality Greek food, head to Avra. There are no bunches of grapes adorning the ceiling, but clean, white cloths on the tables at this restaurant, close to Central Park. Head here for a lunch or dinner of delicious Greek dishes in chic surroundings.